The summer of 2008 was devastating for Iowa. We experienced one of the top five largest natural disasters in U.S. history. 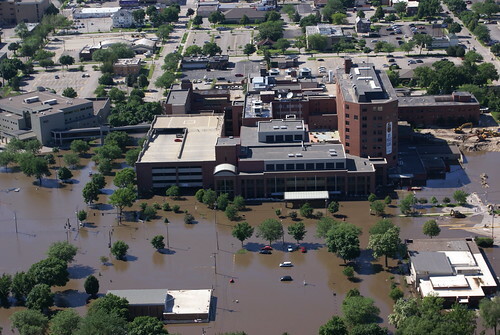 One of the hardest hit areas was downtown Cedar Rapids – which found the Cedar River leaving its banks and eventually cresting at 32 feet: 12 feet higher than any previous flood and roughly 5 times its normal depth. And much to everyone’s surprise, Mercy Medical Center, never considered to be in a flood plain, was threatened and eventually took on water, evacuating its patients in the process. It ended with continuing communication to restore the hospital’s image, leverage local goodwill, and thank the community for its hard work and support throughout the ordeal. And through everything, the Web was a critical channel for providing information to employees, the Cedar Rapids community, and the world. Melissa Erbes, Web Manager at Mercy, and I will be presenting on their crisis communications during the Flood of 2008 as well as the Web’s role in crisis communications more generally at the Society for Healthcare Strategy and Market Development (SHSMD). It’s session F14 on Friday. I hope you’ll join us! Geonetric will also be exhibiting at Booth 408 in the Exhibit Hall. Stop by to say hi, see a demonstration of our newest patient portal, and learn about how our clients are leading the way in social media. This entry was posted in Industry Trends, Social Media, Tradeshow/Conference by Ben Dillon. Bookmark the permalink.